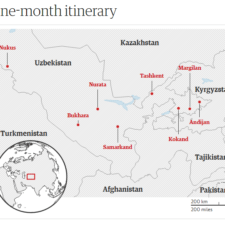 The proposed route includes 8 cities of Uzbekistan: Tashkent, Margilan, Andijan, Kokand, Samarkand, Bukhara, Nurata and Nukus. 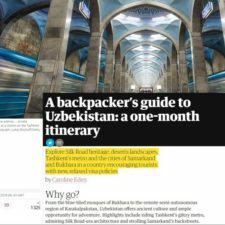 The article notes the visit recommendations for each city, with detailed instructions on how to get there, where to stay, what to eat and how much it will cost. The author sets the minimum daily budget at £ 20–30 per day ($ 26–40).